A fun and creative addition to the iPad studio. Easy to edit effects. Sounds great. Signal flow can't be changed. 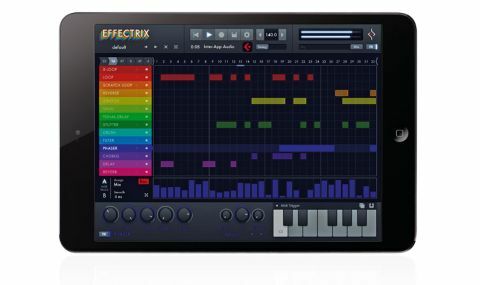 The latest in Sugar Bytes' ongoing series of desktop ports brings one of the most popular multieffects sequencers to your iPad. "Using 14 easy-to-edit effects, wild, glitchy processes are created by simply drawing sequences on each lane"
Using 14 easy-to-edit effects (Filter, Phaser, Scratch Loop, Delay, Reverb and so on), wild, glitchy processes are created by simply drawing sequences on each lane to trigger its associated effect. Each effect features a small but well-formed selection of adjustable parameters, which can be automated throughout the sequence by one of two Modulator tracks on each lane. Sequences can also be triggered via the built-in keyboard or a connected MIDI device - indeed, it's clear that live performance is Effectrix' primary raison d'être. You get a handful of loops thrown in to play around with, but thankfully Audiobus and IAA are supported (as is a Live mode for external input), making Effectrix a fun and creative addition to the iPad studio. As with the desktop version, though, a significant shortcoming is that the signal flow through the effect modules can't be changed.